A few years ago, well-known Danish microphone manufacturers DPA started rebranding their mics into new product groups, comprising the d:fine headsets, d:vote instrument mics, d:facto stage mics, d:screet lavaliers, d:mension multichannel systems, and d:dicate recording mics. It is this last group that concerns us here, as it not only contains the latest incarnations of the long-revered and reference-standard 4006 omni and 4011 cardioid small-diaphragm mics, but also some new lower-cost alternatives. The 4006 and 4011 have been around in one form or another for over 25 years now, originally designed and manufactured by Brüel & Kjaer, before DPA took over in 1992 (see box). However, the company’s d:dicate range now features a completely re-engineered and fully modular 4000-series, which includes five different preamp bodies and a full set of compatible capsules, which retain the familiar legacy model numbers to aid recognition. Moreover, a secondary set of compatible but lower-cost capsules has also been introduced, known as the new 2000-series. Six capsules are currently available in the d:dicate 4000 range, starting with the flagship MMC4006 omni and MMC4011 cardioid capsules. Others include the MMC4007 omni, which is a very high SPL model with a smaller 12mm diaphragm; the MMC4015 wide-cardioid (hypocardioid); the MMC4017, an interference-tube shotgun; and the MMC4018 supercardioid capsule. Any capsule can be used on any of the MMP preamp bodies described below. The underlying concept of the new 2000-series capsules is ingenious, and although looking very similar to the 4000-series externally, this new range — currently comprising just two models — employs a radically different technology inside, and the capsules cost around half that of their 4000-series siblings. These new designs are described as having “twin-diaphragm capsule technology” and in essence they employ a pair of DPA’s familiar miniature omni capsules (derived from the 4060 miniature microphone) mounted together back-to-back to form a composite capsule with two diaphragms. This solution combines the most useful attributes of miniature capsules — basically a very fast impulse response and wide bandwidth — while simultaneously minimising their inherent weakness of a relatively high self-noise by doubling the total diaphragm surface area. However, unlike the standard 4060 miniature microphone, which has an FET impedance converter built into the capsule, the new 2000-series designs take advantage of the more sophisticated electronics in the various partnering MMP preamplifiers, giving a wider bandwidth and a generally improved performance. Of the two 2000-series capsules currently available, the MMC2006 has an omnidirectional polar pattern, while the MMC2011 cardioid capsule achieves its directional properties through the use of a short interference tube — another technology which DPA have developed to a very high standard in recent years. Unlike its more expensive 4000-series sibling, the capsule grid on the MMC2006 is fixed and cannot be replaced to change the acoustic equalisation, and nor can any of the acoustic-pressure-sphere accessories or the nose cone be used with it (see ‘Under Pressure’ box). Five different microphone bodies are available, called the MMP-A, MMP-B, MMP-C, MMP-E and MMP-F, all requiring standard 48V phantom power. (DPA’s unusual 130V high-powered system, which allows greater dynamic range, is still available to special order, if required.) In case you were wondering, there is no ‘D’ model, and all provide the same basic impedance-conversion and transformerless output electronics in an active impedance-balanced configuration. The differences between the different variants lie mainly in their physical configurations, which are optimised to suit different applications. The standard ‘A’ model is 147mm (5.8 inches) in length and the same 19mm diameter as the capsules. 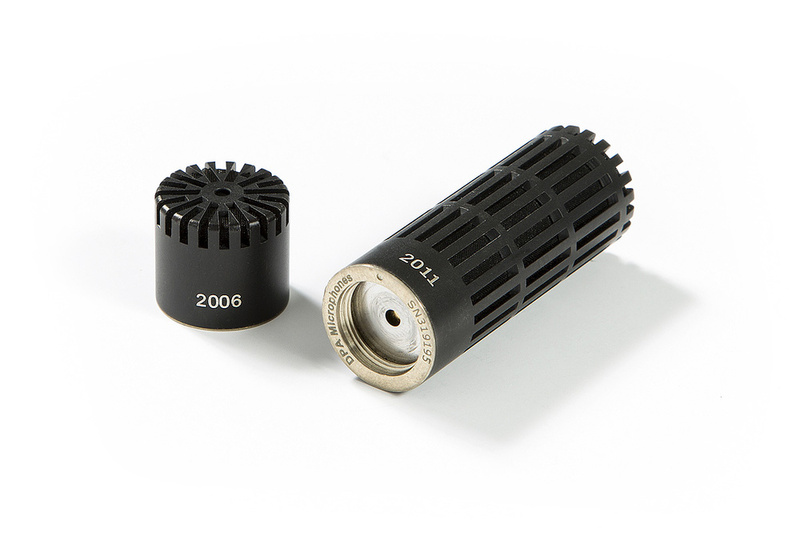 When mated with the MMC4006 or MMC4011 capsules the resulting ‘4006A’ and ‘4011A’ microphones closely resemble the legacy TL4006 and TL4011 microphones in size, styling, and sound quality. 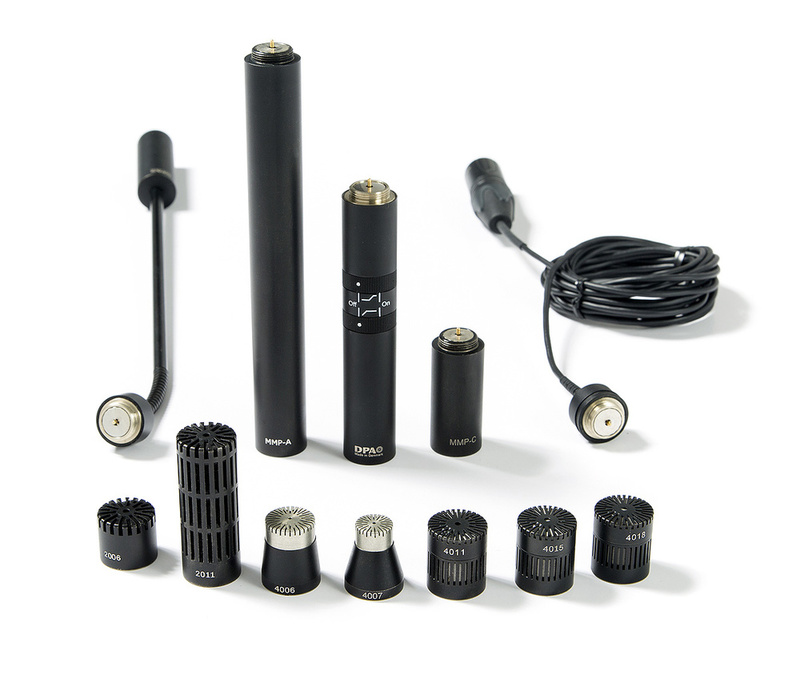 Moreover, this microphone body option offers the highest level of performance in the d:dicate system, with the quietest self-noise (0.5 V, shorted input, A-weighted), the greatest dynamic range capability (138dB), and with a modest 2.8mA current requirement from the phantom supply. In situations where some corrective EQ is necessary, the slightly shorter (99mm or 3.9 inches) MMP-B version is useful as this model features two switchable filters controlled by ring switches halfway down the body. One switch provides a first-order high-pass filter turning over at 120Hz to tame proximity effect, while the second introduces a shelving high-frequency boost of +4dB at 8kHz to correct the response of nearfield-equalised omnidirectional capsules for diffuse-field applications. These filters inherently degrade the noise and dynamic range performance slightly, and also require a greater supply current, so the relevant tech specs are about 7dB noisier (1.1 V), 124dB dynamic range, and 4.5mA phantom current draw). The 2000-series capsules employ a dual-diaphragm design in order to minimise self-noise.Applications where a smaller overall size is appropriate call for the MMP-C and -E models. The ‘C’ (or ‘Compact’) preamp is just 41mm (1.6 inches) in length and, interestingly, is described as having a slightly softer sound character than the MMP-A and -B preamps. Its technical performance is almost the same as the MMP-A model, with just 1.5dB more noise (0.6 V) and 136dB dynamic range. The current requirement is 2.8mA. There are two MMP-E (‘active Extension cables’) variants, with the cable entry either at the side (MMP-ES) or rear (MMP-ER) of the body. As the output driving electronics are relocated into the XLR plug body, the section to which the capsule attaches is just 19mm (0.75 inches) in length, and cable lengths are available from three to 30 metres. This model is really intended for applications where the mic is either suspended on its own cable or mounted in confined spaces, and various mounting accessories are available for these purposes. The self-noise performance of the MMP-E is the same as the Compact version (0.6 V), but the dynamic range is slightly lower (131dB), and the current demand slightly higher (3.5mA). Also available are various MMP-F ‘active booms’ — basically tubes onto which the capsules can be fitted for elegant table, podium or floor-standing applications. Five standard boom sizes are offered, with 150, 300, 450, 750 and 1200 mm standard lengths, although custom lengths can also be supplied. The 150mm version is a flexible gooseneck, while the others have gooseneck sections at the top of a rigid tube, or at both the top and bottom of a rigid tube. All versions employ the same electronics and technical performance as the MMP-E active extension cable preamps. As far as accessories go, DPA Microphones have always excelled in that department, and that’s certainly true for the d:dicate range, where every possible option and requirement appears to be covered. Seven different capsule grids, nose cones and acoustic-pressure equalising spheres are available for the 4000-series capsules, along with various stereo-bars and a comprehensive collection of hanging and mounting hardware. Everything is thoughtfully designed and manufactured to high standards. I note the SM1500 shockmount (and related models) employs the ingeniously engineered Rycote InVision lyre system, too. 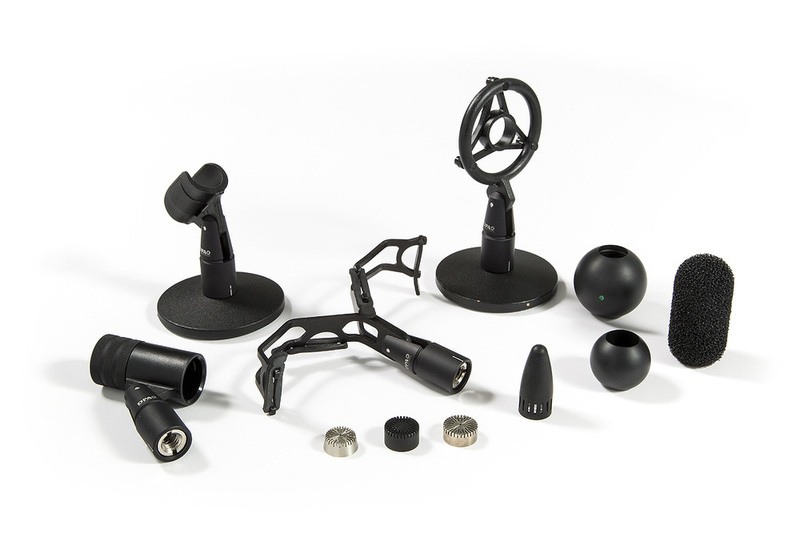 The modular nature of the d:dicate range creates many interesting possibilities, allowing different microphones to be constructed to suit different applications very easily and cost-effectively. It also makes it possible to start with the more affordable 2000-series capsules and upgrade later to the 4000-series as funds allow, without having to reinvest in new preamps and hardware accessories. If you’re looking for colour, character or ‘vibe’ in your microphones the d:dicate range is not where you need to look, but if you’re after definitive levels of accuracy, transparency and fidelity then it’s hard to beat DPA’s 4000-series capsules. These deliver a delicacy and precision that very few other microphones can match. The ingenious 2000-series capsules sound almost as good in isolation, although lose out slightly in direct comparison against their 4000-series siblings. Comparing the 4006A and 2006A microphones (MMC4006 and MMC2006 capsules on MMP-A preamps), for example, it became evident that the 4006A has a slightly greater bass extension and a smoother overall response, while the 2006A has a gentle but obvious rising response at extreme HF. In different applications this brighter character was perceived either as being more ‘airy’ or more brittle-sounding, but with neither being ‘wrong’ or unusable, just different. With the diffuse-field grid fitted to the 4006A but the mic placed in the nearfield of a source, the HF character of the two mics became more similar, although the 4006A still sounded subtly smoother and cleaner. Both mics have broadly similar off-axis behaviour, but the 2006A becomes slightly more directional above about 8kHz, and its off-axis response just wasn’t quite as neutral and smooth as its more expensive sibling. Both the 4006A and the 2006A share the same relatively high sensitivity at 40mV/Pa, which is about 12dB louder than DPA’s cardioid capsules — something which caught me out when swapping capsules during a session! The specifications suggest that the MMC4006 is 1dB quieter than its lower-cost sibling, but that’s too small a difference to notice in practice, and both capsules are commendably quiet. The 4006A also has a theoretical 6dB dynamic range advantage (up to 147dB, depending on preamp module, which is about 3dB more than the former TL4006 model could deliver), but the 2006A can cope with an impressive 141dB SPL anyway, so it’s not something that’s going to worry most users. To the casual observer it’s quite hard to tell the MMC4006 and MMC2006 omni capsules apart. However, the former is a few millimetres longer and a few grams heavier than its sibling, and it also has a slightly reduced diameter across the (removable) grid. Thankfully, though, the model numbers are etched neatly into the side of the capsules to remove any guesswork! Distinguishing between the MMC4011 and MMC2011 cardioid capsules is a lot easier because of the short interference tube employed on the latter. Not surprisingly, therefore, the 2011 is the larger of the two, measuring 51mm in length and weighing 24g (the 4011’s equivalent figures are 23mm and 18g). One point to bear in mind when using a pair of MMC2011s in a coincident (or near-coincident) stereo array is that the acoustic centre of the diaphragm is at the base of the interference tube, not the end. This means that the mics must be rigged in such a way that their interference tubes overlap and crossover 36mm from the end grilles. Both cardioid capsules share the same sensitivity of 10mV/Pa, which makes A/B comparison straightforward. In a direct comparison, the 2011A’s bandwidth sounds slightly curtailed at both ends when compared to the 4011A, and it also has a similar HF boost to the 2006 capsule (albeit starting a little lower in frequency). The 2011A is also a few decibels noisier than the 4011A, which could just be discerned in straight A/B comparisons. A wide range of accessories is available, including various mic mounts, capsule grids and acoustic pressure cones and spheres.Once again, the twin-diaphragm 2011A model has a slightly diminished dynamic range compared to the 4011A, but this is still unlikely to be a problem in practice as it will handle 153dB SPL, depending on preamp. (For really demanding situations, the 4011A microphone will tolerate an astonishing 159dB SPL!) Having said that, when used in front of seriously loud sources, like powerful guitar amps or around drums, I noticed that the 2000-series capsules tend to introduce a little harmonic distortion, which is absent from the 4000-series equivalents. As I said earlier, you don’t buy DPA mics for their ‘character’ — quite the reverse, in fact — but I quite liked what the 2000-series did when pushed hard! Probably due to the physics involved in the interference tube design, I noticed that the 2011A loses the high end more rapidly than the 4011A as the source moves off-axis, and the overall off-axis response is not quite as linear as its sibling. Interestingly, though, the 2011A has a noticeably deeper rear null, and while the 4011’s null might be slightly better in the mid-range, the 2011A wins hands-down at the frequency extremes. I also tried the MMC4015 hypocardioid (wide cardioid) capsule in a few situations and quickly became rather attracted to it. Not surprisingly, this capsule retains most of the bandwidth and tonal advantages of the straight omni capsule, while providing a useful amount of rearward rejection. If investing in the d:dicate range myself, I would be very tempted by a pair of 4015s as I think I’d make more use of them than either the 4006 or 4011. Re-engineering the 4000-series microphone range into a modular system brings great benefits in terms of versatility and affordability, and there is no downside as far as I can see or hear. The new lower-cost capsules offer an attractive way in to the system, too, with only a small performance penalty compared to the flagship 4000 capsules. Overall, this is a very impressive microphone system which I enjoyed using very much indeed. Several manufacturers make small-diaphragm modular microphone ranges, such as Neumann (the KMA/KMD range, with either analogue or digital output bodies and a wide range of capsules), Schoeps (the modular Colette series), AKG (the ULS series) and Sennheiser (the K6 system). Classical recording engineers the world over have long held the 4006 omnidirectional and 4011 cardioid microphones in high esteem, and they are recognised universally as being among the finest and most transparent microphones currently available. They were originally designed and manufactured by Brüel & Kjaer in Denmark, a company that specialises in audio measurement rather than studio microphones. However, such was the demand for these exceptional mics that two former employees suggested setting up DPA Microphones in 1992 specifically to handle the distribution and servicing of B&K’s 4000-series studio mics. DPA subsequently took over the complete manufacturing of the 4000-series mics, and the company now produces a wide range of microphones under its own name, mostly based on innovative miniature capsule designs. The 4000-series designs have also undergone further development, with the introduction, around 10 years ago, of a transformerless impedance-converter design, leading to the ever-popular TL4006 and TL4011 models. Many are surprised to learn that the 4000-series microphones are sophisticated back-electrets, rather than conventional DC-biased capacitor mics. B&K developed this technology in the early 1980s because it enjoys several important advantages over the traditional approach. First, the static charge stored inside the capsule produces a bias voltage between the backplate and diaphragm of around 250V — far higher than that of most DC-capacitor mics. A higher bias voltage allows the diaphragm to be spaced further from the backplate without sacrificing sensitivity and, since the ratio of diaphragm movement to the overall spacing becomes much smaller, distortion products are also reduced considerably. Another major benefit of this greater diaphragm spacing is an increased SPL capability. Below are the list prices for ‘complete’ d:dicate-series microphones, where the four-digit number indicates the type of capsule, and the letter the type of MMP preamp (note that the capsules and preamps are also available separately). All prices include VAT. Acoustic-pressure equalisers are entirely passive devices, usually comprising a solid ball of plastic with a hole bored through the middle. These fit around the mic and are designed to affect the way sound diffracts around the capsule, by causing a pressure build-up that changes the sound field close to the diaphragm. The effect is to boost the mid-range and HF response for on-axis sources in a kind of acoustic shelf equaliser. The nose cone that DPA offer, on the other hand, is designed to do the opposite: it counteracts the directionality that small-diaphragm omni mics all suffer from at high frequencies. In either case, acoustic-pressure equalisers only work with omnidirectional pressure-operated microphones. Reference-standard quality with modular flexibility. Lower entry costs thanks to the 2000–series capsules. Wide range of capsule options. Useful selection of body variants. High quality always comes at a price. DPA’s classic microphones, updated and re–engineered into the d:dicate modular format with improved specifications and versatility.